BATON ROUGE - Police have recovered a hefty, androgynous statue just minutes away from where it was stolen in downtown Baton Rouge. 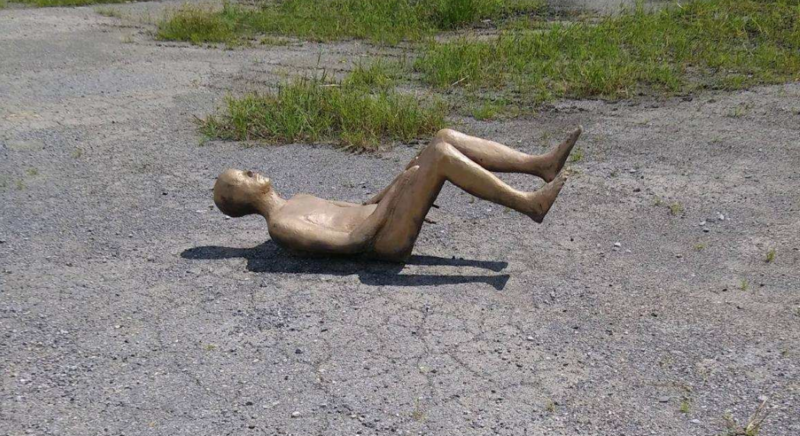 According to BRPD, the distinct, human-shaped sculpture was removed from a park bench along the levee. Investigators believe it was taken sometime between March and April. After police announced they were looking the statue, an anonymous tip Friday morning led them to a parking lot on Oklahoma Street near River Road. There, officers found the 400-pound piece lying in the middle of the lot. The Arts Council of Baton Rouge says the statue had been vandalized, but the damage was "reversible". In a photo released by BRPD, the statue appeared to have been spray-painted gold. There's still no word on who may have taken it in the first place. The statue was one of several erected in downtown last year. The figures were placed all around the area as part of the Borders display by Icelandic sculptor Steinunn Thorarinsdottir. The statues are situated in different poses - sometimes standing, sitting or kneeling - and are meant to call attention to cultural, political and social diversity. The display was intended to stay in Baton Rouge for a year before moving on to another major city. Last year, officials told WBRZ the display was paid for through private donations and no city funds were used.